Take your beloved pet home in a Faithful Feline figurine urn. These hollow cat urns are made from a mixture of granite stone particles and durable resins to form a beautiful in-home memorial container for your beloved pet's ashes. Available in two attractive "cream" colored styles, the Faithful Feline figurine urn attempts to capture the likeness and spirit of your fallen friend. Durable resin construction makes these urns mush less brittle than true porcelain, but with the same look and high quality feel of real stone. Outdoor use is acceptable for figurine only. Easy "screw-on" threaded bottom plug for simple installation and tamper resistant protection of your pet's ashes. Available with or without a premium walnut display base. When you purchase the solid walnut base you receive a personalized brass nameplate. 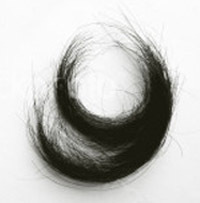 May we extend to you our heartfelt condolences on the loss of your 'pet. Their souls, and the bonds you have formed with them, live eternal. 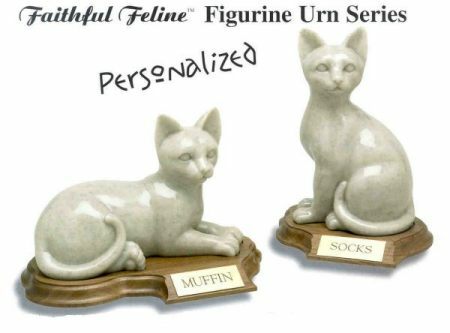 The Faithful Feline figurine urns not only honor your beloved companion, but they assist you and other family members in the process of grieving and help bring positive closure to this phase of your lasting love and friendship. 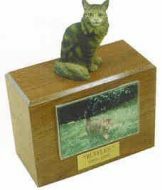 Laying Cat w/ Base & Plate 11"x6"x6.5"
Sitting Cat w/ Base & Plate 7"x6"x9.5"
Take your beloved pet home in a Faithful Feline figurine urn. These hollow cat urns are made from a mixture of granite stone particles and durable resins to form a beautiful memorial container for your beloved pet's ashes. Available in two attractive cream-colored styles, the Faithful Feline figurine urn attempts to capture the likeness and spirit of your fallen friend. Durable resin construction makes these urns much less brittle than true porcelain, but with the same look and high quality feel of real stone. Inside capacity of the Faithful Feline figurine urn permits cat owners to use the same urn for up to 2-3 pets, depending on pet size and style selected. May we extend to you our heartfelt condolences on the loss of your pet. Their souls, and the bonds you have formed with them, live eternal. 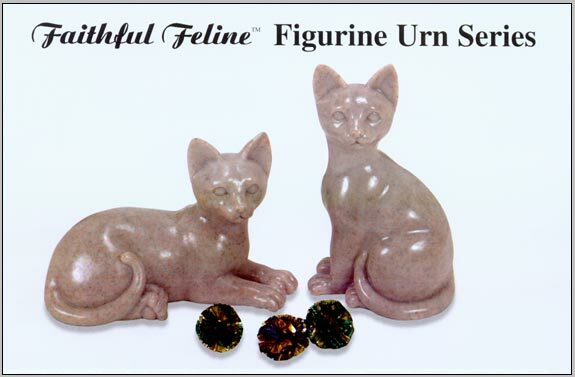 The Faithful Feline figurine urns not only honor your beloved companion, but they assist you and other family members in the process of grieving and help bring positive closure to this phase of you lasting love and friendship. Laying Cat approx. 9" x 4" x 6" (LxDxH) 21 cubic inches 0-21 lbs. Sitting Cat approx 5" x 4" x 9" (LxDxH) 30 cubic inches 0-30 lbs. All of the below urns come in three wood types to choose from (Maple, Oak, Walnut). They also come in all sizes (Small, Medium, Large, Extra Large). depending on the urn size, and personalized brass plate. Our standard figurine urns come in over 280 varieties of dogs and cats. The base of our standard figurine urn is 8" x 6" and the urn stands 5-8" tall, including the figurine. Standard figurine urns come in the same 4 sizes as our traditional urns. Available in natural Maple (very light blonde), Oak (light brown), or Walnut (darker brown). Ashes are installed through removable bottom panel which is secured with 4 screws. Our large figurine urns come with a slightly larger box and noticeably larger line of figurines (available in over 100 varieties of dogs and cats). They are designed for the pet owner interested in a slightly bolder display. The base on our large figurine urn is 9" x 7" and the urn stands between 7"- 10" tall, including the figurine. The large figurine urn is only available in "large" or "extra-large" sizes to preserve the character of a more prominent display. If extra space exists inside the urn, many pet owners place special items such as pet collars and/or nametags inside. Two common requests are to have a photo holder attached to the top of a traditional urn or to have a figurine attached to the top of a photo urn. Feel free to make these special requests to meet your special needs. Designed "to stand on edge" to accommodate the "front" surface mount of a lucite 3" x 5" or 4" x 6" photo holder. Pet owners can easily insert their favorite photo of their pet for a truly personal memorial. These urns are particularly well-suited to pet owners whose cat or dog is not represented in our line of figurines. These beautiful hardwood urns are available in natural Maple (very light blonde), Oak (light brown), or Walnut (darker brown) and also come with a premium leaded brass nameplate (custom engraving available). All of our hardwood urns have a removable bottom panel which is secured with 4 screws and are available in 4 sizes, depending upon the size of your pet. length 8", height 6", width 2.5", 3.5", 4.5, or 5.5" (s, m, l, xl). Inside dimensions are 1" less in each direction. We will make a reasonable effort to accommodate any requests for custom urns or "combination" urns. 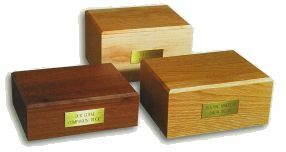 Most of our hardwood urns are available in natural Maple (very light blonde), Oak (light brown), or Walnut (darker brown) and come with a premium leaded brass nameplate (custom engraving available). Please note, that due to natural inconsistencies in wood color that there may be some differences in color between your urn and those pictured in this catalog. All of our hardwood urns have a removable bottom panel which is secured with 4 screws. Our traditional urn is an elegant and attractive option for pet owners seeking to preserve the memory of their pet. These beautiful memorials are handcrafted from American hardwoods and are available in natural Maple (very light blonde), Oak (light brown), or Walnut (darker brown). 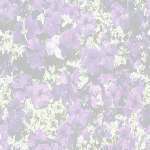 Their simple design makes them an attractive yet subtle presence in any home or office. Available in four sizes depending upon the size of your pet. A premium leaded brass nameplate is included (custom engraving available). The brass nameplate may be positioned on top center as opposed to front-center if desired. 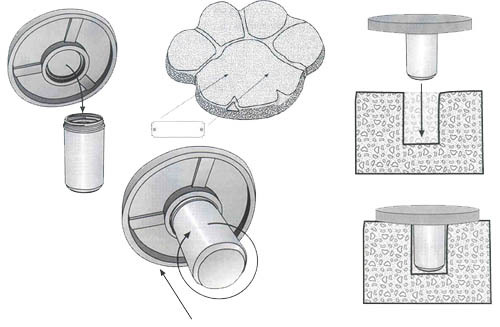 All traditional urns have a removable bottom panel secured with 4 screws. Approx. outside dimensions: length 8', width 6", height 2.5", 3.5", 4.5", or 5.5"
extra large not shown. Inside dimensions are 1" less in each direction. Our Tower Series� Photo Urns are designed for the pet owner who wishes to display their favorite "vertical" photographs. Made from solid imported Mahogany, Oak, or Beech, the Tower Series urn makes a beautiful display of your love and affection for your fallen friend. Available in small, medium, and large depending on the size of your pet, this urn includes your personal (4 line 100 character) inscription on a premium leaded brass nameplate centered below the photo holder. Prices range from $97.95 to $136.95 depending on the size of urn required to accommodate your pet's ashes. (Please note that you cannot choose the size of photo holder for this urn. The Small Size comes with a 2.5"x 3.0" holder, the Medium Size comes with a 3.5"x 5.0" holder, and the Large Size comes with a 4.0"x 6.0" vertical holder. Many people purchase a larger size than dictated by their pet's weight because they want a larger size photo holder. ) Overnight and 2-Day air shipping available at additional cost. Useful information: Your pet's ashes are commonly returned to you by your veterinarian in an utility (inexpensive) urn or container. The ashes are bagged inside and easily transferred without alteration into the bottom of one of our urns. If you should have to re-bag your pet's ashes, we provide a clean new bag for that purpose. Ashes are always bagged to avoid accidental loss should an urn be dropped or broken during transport. If you are uncomfortable handling your pet's ashes, ask a close family member or your clinic staff to do it for you, they will understand. Dimensions listed above are approximate outside dimensions of the urn. Inside dimensions are generally about 1 inch smaller in each direction. Cubic dimensions are approximately 35, 110 and 250 cubic inches respectively for the S, M & L urn. Take your beloved pet home in a Granite Garden Stone Urn. can be placed in a flower garden or displayed on your mantel. of taking them with you should you ever have to move. Durable poly-resin construction provides reliable outdoor protection for your pet. Quality detailing makes these imitation granite stones took like the real thing. Ashes installed through bottom of urn and seated with a 3" threaded plug. Custom engraved outdoor plate with up to 4 lines. Small $ 117.95 6" x 6" x 5" 30 cu. in. 0 - 20 lbs. Medium $ 125.95 7" x 6" x 7" 50 cu. in. 21 - 35 lbs. Large $ 137.95 10" x 7" x 10" 125 cu. in 36 - 100 lbs. XLarge $ 159.95 15" x 10" x 13" 700 cu. in. 101 - 500 lbs. 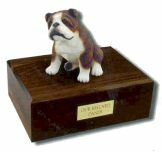 These solid wood "doghouse" styled urns create an attractive in-home memorial for your beloved pet. Each urn comes complete with a 2�" by 3�" removable Lucite photo holder which is attached magnetically. With little effort you can remove the door-shaped photo holder, slip your "trimmed" photograph inside and re-attach the photo holder. Personalized brass nameplate included. We allow up to 4 lines of engraving (25-30 characters per line). Orders are delivered in 6-12 days from the time your order is placed. Urn interior is accessible by removing the urn bottom which is secured with (4) phillips-head screws, allowing pet owners to install personal effects such as nametags or other personal remembrances if desired. The urn interior is large enough to hold the ashes of up to a 100 pound pet. May we extend to you our heartfelt condolences on the loss of your pet. Their souls, and the bonds you have formed with them, live eternal. These urns not only honor your beloved companion, but they assist you and other family members in the process of grieving. Until we meet again at the Rainbow Bridge, let's hold dear the memories of our fallen friends. $ 119.95 6�" x 5�" x 6�" 120 cu. in. 9" x 6�" x 7" 0-100 lbs. 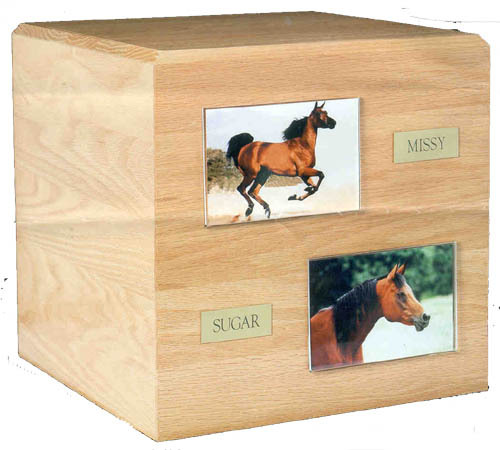 Our Horse Cremation Urn is a simple, yet elegant way to memorialize your fallen animal friend. Each cremation urn is made from solid oak hardwood lumber and measures 13�" in each direction with a decorative top beveled edge. The inside of each urn is 1,950 cubic inches. The inside is accessible through the bottom panel which is secured with 12 screws. As pictured you may choose to receive photo holders, engraved brass nameplates and horse breed figurines. these options may result in additional charges. We ship each option unattached so that you can decide what look you prefer in you home or office before actually adhering them to the wood urn. Securing any of these items to the urn is easily achieved through the use of double sided adhesive which we provide with each urn order. Pet Memories is proud to announce our new Pet Memorial Keepsakes�. The Keepsakes are cast in heavy weight, stone-like resin and are available in three designs. Each Keepsake has a clear plastic capsule inset into the back of the memento for a lock of your pet�s hair, baby teeth or a photograph. For Retailers, The Pet Memorial Keepsake� comes complete with a counter top display canister that includes six of each style. all labeled for individual sale. We realize that your pet is a very important part of your life. 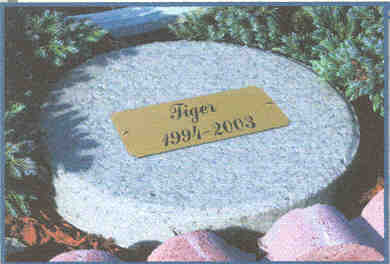 For this reason we have created the Pet Memorial Marker and Urn. These weather proof polyresin Markers can be used as a repository for your pet's ashes or as a memorial marker. 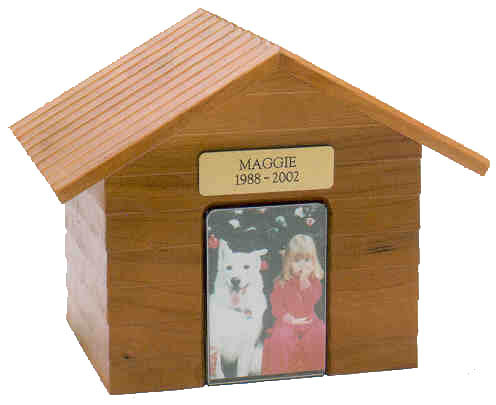 Either way, the Pet Memorial Marker & Urn will be a lasting tribute to your beloved family member. Included with each Marker is a n optional 5" x 2" brass plaque ready to be engraved with your pets name with space for a tribute to your faithful companion. This simple circular marker will blend in with any landscape and will age naturally with weathering. 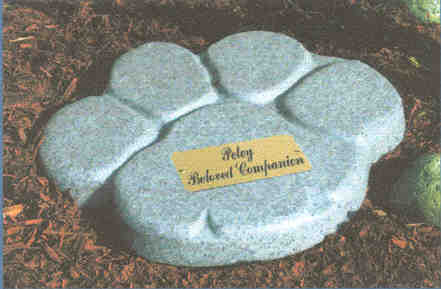 This Pet Memorial Stone offers you a lasting way to symbolize how much your companion meant to you. Shaped like a paw print, this Marker will stand out in your garden as a memorial to your beloved pet. The granite-look finish will gracefully age and the polyresin construction will withstand a lifetime outdoors. 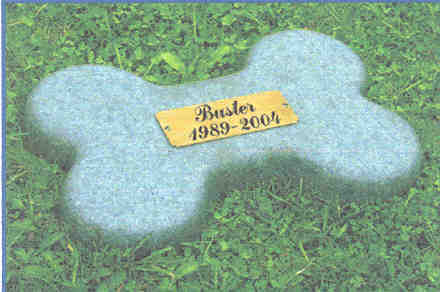 The Bone shaped Memorial Marker shows a fond remembrance for your pet. Made of the same material as the Stepping Stone and Paw Marker, the Bone Memorial Marker will be a lasting tribute to your pet. in your yard or garden. Please accept our sincere condolences on the loss of your animal friend. "HELPING YOU ENJOY THE MEMORY OF YOUR PET"